many people facing issue in configuration of Zend Framework 2 lately. The manual on Zend Framework‘s website is horrible (in terms of beginner manual and documentation) and is designed for advanced user’s with Zend Framework 1 extensive experience. Many users are still unable to create a first basic folder structure to begin using Zend Framework 2 library. The initial example is provided here. I’m going to break it down for you guys. This file provides you with all the necessary files to create your basic folder structure. Step 2: Open your Terminal. (In Windows 7, click Start and in the search box type “cmd” (no quotes), and click cmd.exe. Step 4: Now type this command, “php composer.phar self-update” and press Enter. Step 5: Type another command, “php composer.phar install”. This will create your directories for basic skeleton application. That’s all. Now, open your browser and navigate to your localhost and zf_project1/public folder (mine looks like this: http://localhost/zf_project1/public/). You should see this website. If you do, then every step has been successfully completed. And copy it to zendtool folder. Step 3: Open your Terminal. (In Windows 7, click Start and in the search box type “cmd” (no quotes), and click cmd.exe. Step 4: Once opened, use the “cd” command to navigate to the folder where you created your project in your root (www) localhost folder. My command looks like this “cd C:\Program Files\php_5_4_15_Win32_VC9_x86\www″. You should be inside the root folder now and your line in Terminal should resemble this “C:\Program Files\php_5_4_15_Win32_VC9_x86\www>″. This means zendtool install and working fine. ZF2 skeleton application installed in zf_project1. Now you should be inside the project folder and your line in Terminal should resemble this “C:\Program Files\php_5_4_15_Win32_VC9_x86\www\zf_project1>″. Step 8: Now type this command, “php composer.phar self-update” and press Enter. Step 9: Now type this command, “php composer.phar install” and press Enter. – The requested package php >=5.3.3 could not be found. – zendframework/zendframework 2.2.0rc3 requires php >=5.3.3 -> no matching package found. – zendframework/zendframework 2.2.0rc2 requires php >=5.3.3 -> no matching package found. – zendframework/zendframework 2.2.0 requires php >=5.3.3 -> no matching package found. see <https://groups.google.com/d/topic/composer-dev/_g3ASeIFlrc/discussion&gt; for more details. Read <http://getcomposer.org/doc/articles/troubleshooting.md&gt; for further common problems. This means PHP version not appropriate, you must have 5.3.3 or above. download your desired version of php binary from http://windows.php.net/download/ website. download Thread Safe binary zip version. Unzip the downloaded version of the PHP in a separate folder. Please make sure that your new php folder name is not “PHP”. May be you can use filder name as the version name. For example for php 5.4 you can use php54. Save the file httpd-xampp.conf. Restart your XAMPP apache server. If your server get restarted successfully then your server php version is upgraded. ind the socket transport “ssl” – did you forget to enable it when you configured PHP? This means openssl not enabled in php, you must enable it. Now i hope you will install ZF2. 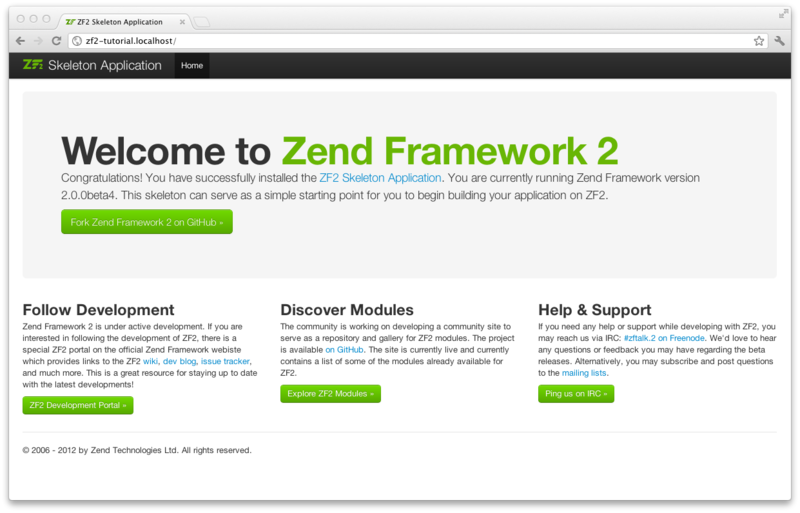 Here is step by step guide to create a module in a zend framework 2 application using zendtool. Zendframework 2 project created with zf2 installed. Step a: Open your Terminal. (In Windows 7, click Start and in the search box type “cmd” (no quotes), and click cmd.exe. Step b: Once opened, use the “cd” command to navigate to the folder where you created your project in your root (www) localhost folder. My command looks like this “cd C:\Program Files\php_5_4_15_Win32_VC9_x86\www″. You should be inside the root folder now and your line in Terminal should resemble this “C:\Program Files\php_5_4_15_Win32_VC9_x86\www>″. Similarly other commands of zendtool can be used in zf2 application.